QR-Patrol consists of several innovative features and offers the ability to monitor all of your places by a single position via smartphone technology. Having downloaded the mobile application, you are ready to get advantage of all of its functionality and send immediate incidents reports to the monitoring center. To get started, one of the first tasks is to assign points to your assets. On the main screen of QR-Patrol mobile application, press the Checkpoint assignment button. 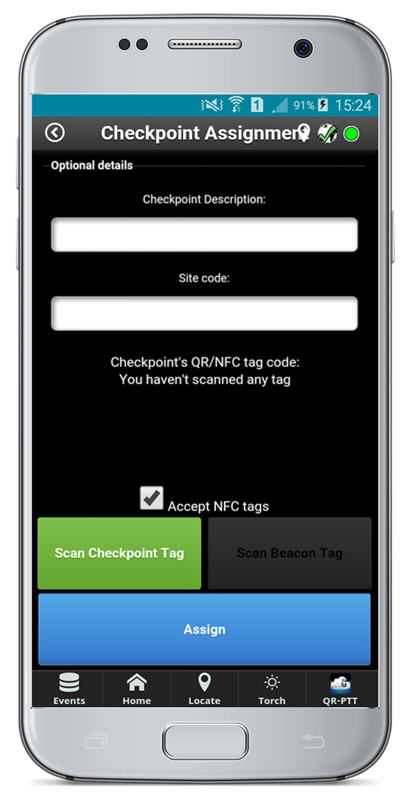 Drag the NFC tag on the back of your device (make sure that the NFC feature of your phone is enabled). To assign the tag to a specific site, press the "Assign" button and on the Check Points tab of your web-app (Company -> Check Points), select a point from the list, click on "Edit" and choose the Client and the Site that you want. Alternatively, you can add a description and fill in the unique Site Code (you can find this code on your web-app, on the Clients tab: Client -> Details). Finally press the "Assign" button and your checkpoint is ready! You can assign QR-code checkpoints from your device, just by following the steps above. Select one of the check points from your list and click on "Edit". After choosing "Manage Points", a window will pop-up. At the bottom of this window, there is a list with all your checkpoints. To add one or more of them to the specific site, check the one(s) you want and press the plus sign. Finally, to complete the assignment, press the "Confirm" button.